Education undersecretary Ted Mitchell said that the nation has a “moral responsibility” to close the gaps in STEM degree attainment. Education undersecretary Ted Mitchell joined a roundtable conversation Monday on the role that historically Black colleges and universities play in helping diversify the STEM pipeline and workforce at the National Academies of Sciences, Engineering, and Medicine. HBCUs, which make up 3 percent of the nation’s colleges and universities, produce 27 percent of African-Americans with bachelor’s degrees in the STEM fields, according to the Education Department. The top 10 schools producing the largest number of Black students who go on to get a graduate degree in science and engineering are HBCUs, according to the National Institutes of Health. Tuskegee, in 10th place, is tied with the University of Maryland-Baltimore. Despite the accomplishments of some schools, significant disparities in STEM degree attainment persist. One particularly striking example of the disparities that exist in terms of attainment in the STEM field is the number of Black men who enter the medical field each year. According to a 2015 report from the Association of American Medical Colleges (AAMC), the number of Black men applying to medical school has actually declined between 1978 and 2014. In 2014, 1,337 Black men applied to medical school. Only 515 matriculated. By comparison, Black women, Hispanics and Latinos, and Asians are applying to medical school in greater numbers. Speakers at the roundtable praised the accomplishments of institutions such as Xavier University, Spelman College, Howard University, and Morgan State University. “That outsize difference is seen not just across HBCUs but in individual institutions as well,” Mitchell said, in reference to the disproportionate success some HBCUs have had in preparing their graduates for a career in the STEM fields, compared to both predominantly White institutions and other HBCUs. Mitchell added that the nation as a whole has a “moral responsibility” to close the gaps in STEM degree attainment. Chancellor Britt Kirwin represented the University of Maryland at the roundtable. Kirwin pointed to the success of UMBC’s Meyerhoff Scholarship Program, which has been in existence since 1988 and has guided hundreds of Black, Hispanic, and economically disadvantaged White students into academic research programs. 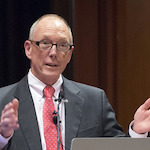 He noted that Penn State and the University of North Carolina, Chapel Hill, both launched their own adaptation of the Meyerhoff Program in 2013.